Preparing the vegetables and herbs. Wash and dry out the herbs. Slice the tomato and the onion. Cut the salmon into portions, about the size of your hamburger buns. Before cooking, remove the salmon from the refrigerator and let it sit at room temperature for about 10 minutes so that the salmon will cook evenly. The salmon fillet can be grilled or fried on a skillet. For grilling, set the grill to medium high heat and brush the grill rack with oil. Brush the salmon filet with olive oil and sprinkle it with salt and pepper. Grill both sides until salmon is cooked through (3-4 minutes per side), then remove from the grill. For frying, preheat a nonstick skillet over medium heat. Season the salmon with salt and pepper. Add one tablespoon of vegetable oil to the skillet. Place the salmon in the skillet and fry one side until golden brown (about 4 minutes), then turn the salmon fillet over and cook it for another 3-4 minutes until it is firm to the touch. While the salmon is cooking, prepare the buns. The buns will taste better when toasted. Split the bun in half, place it cut side down on the grill, and toast until golden brown, or place the split bun halves cut side up on a baking sheet and toast them under a preheated broiler until golden brown. Alternatively, you can toast the buns on a preheated pan. 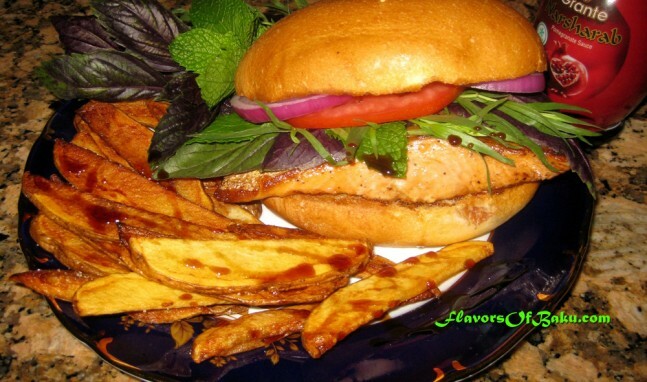 To assemble the burger, place the salmon on the bun and pour narsharab sauce on top. Place the herbs, tomato slices, and thinly sliced red onion on the salmon. Serve with french-fried potato wedges.